a technique in which a flap is incised in the shape of a V but advanced and inset so that the resulting suture line has the shape of a Y; used to gain additional length of tissue. A surgical method for lengthening tissues in one direction by cutting in the lines of a V, sliding the two segments apart, and closing in the lines of a Y. 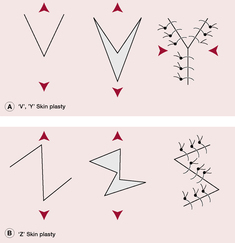 Figure 1: (A) V-Y plasty. (B) ‘Z’ skin plasty. This article was published in Neale's Disorders of the Foot, Lorimer, French, O'Donnell, Burrow, Wall, Copyright Elsevier, (2006). V-Y plasty has been done in 12 cases with good results in 6 cases, fair in 4 and poor result in 2 cases. The nose was opened using a V-Y plasty along the midphiltrum because of the soft-tissue deficiency along the columella and the need to recruit an extra skin envelope to allow closure over the grafts (figure 2). The most common among them were, reconstruction with v-y plasty, if the defect is less than 3cms, reconstruction with Peroneus brevis (PB), (3, 4) or Flexor halucis longus (FHL) (5, 6) tendons transfers if the defect is more than 3cms. After excision of scar tissue, the defect was more than 4cms in all our cases hence reconstruction with v-y plasty was not performed, and opted to go for reconstructive procedures only.